Jinn’s Curse is a two player competitive resource management game. 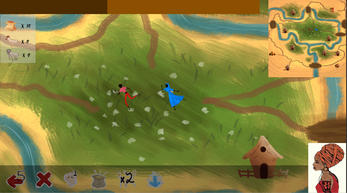 Two opposing factions battle for control of territory while gathering the resources they need to curse their opponents. During the first phase of the game players can buy resources or cast spells. During the second they must move throughout the board gathering spices from farms and capturing temples. Jinn’s Curse draws inspiration from my recent trip to Zanzibar, Tanzania. It’s art style is based on modern east african trends and the content is based on my experiences. We strived to make this game fun and not offensive. This game was made during Production 1. During Production 1 students work as teams to make games on a short timeline. This game was made by a team of four students over the course of three weeks. We strived to remove all placeholder assets from the project and deeply apologize if we accidently left any in.